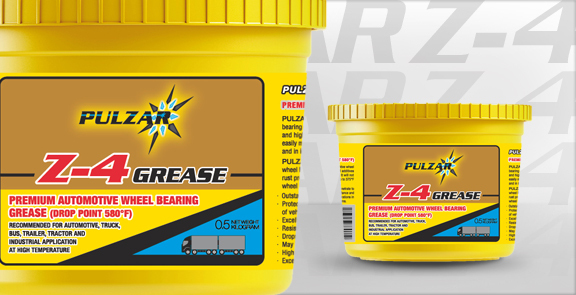 PULZAR Z-4 GREASE is a premium grade lubricating grease, specially engineered for automotive wheel bearings in heavy duty trucks and passenger vehicles equipped with conventional, disc and antilock braking systems. It contains variety of special additives and high quality base oils that enhance the protection property of the grease. It can be used with confidence at continuous temperatures up to 375°F and intermittent temperatures up to 450°F without melting. PULZAR Z-4 GREASE has a proper hardness that makes it easy to use and will effectively penetrate to wheel bearing for a maximum protection. It provides an excellent water washout resistance and rust protection. PULZAR Z-4 GREASE is a heavy duty grease for automotive wheel bearings operating under heavy loads, extreme pressure, high temperature and severe vibration. A true multi-purpose grease for all automotive application-ball joints, chassis, and U-joints, stocking PULZAR Z-4 GREASE eliminates the need to inventory other grease. PULZAR Z-4 GREASE is also recommended for many industrial applications.